Tickets must be purchased as a subscription for all five lectures. There are no single ticket sales. Subscriptions are non-refundable and non-exchangeable. If you are unable to use a ticket that you purchased, we recommend giving or selling the ticket to a friend. All tickets purchased by August 31 will be mailed the second week of September. Tickets purchased after August 31 will be held at Will Call at the Town Hall South membership desk located immediately outside of the theater entrance. All of our lectures are open seating. The Upper St. Clair High School Theater seating total capacity is 865 and is contained on one level. Seating for individuals requiring special needs will be available in the last row, center section of the theater. These seats have wheelchair accessibility and easy access to the exits and restrooms for individuals who have limited mobility. The acoustics are equally desirable throughout the Upper St. Clair High School Theater for individuals who have difficulty hearing. For the first time, we will be offering to our subscribers the option to select and reserve their seat for all five 2019-20 lectures for an additional cost of $25 for the season. This is a limited offer. All of our lectures are open seating. The Upper St. Clair High School Theater seating total capacity is 931 and is contained on one level. Seating for individuals requiring special needs will be available in the last row, center section of the theater. These seats have wheelchair accessibility and easy access to the exits and restrooms for individuals who have limited mobility. The acoustics are equally desirable throughout the Upper St. Clair High School Theater for individuals who have difficulty hearing. From Route 19N exit at McLaughlin Run Road, (USC/Orange Belt), turn right at end of ramp onto McLaughlin Run Road. Turn right at first light onto Panther Pass. 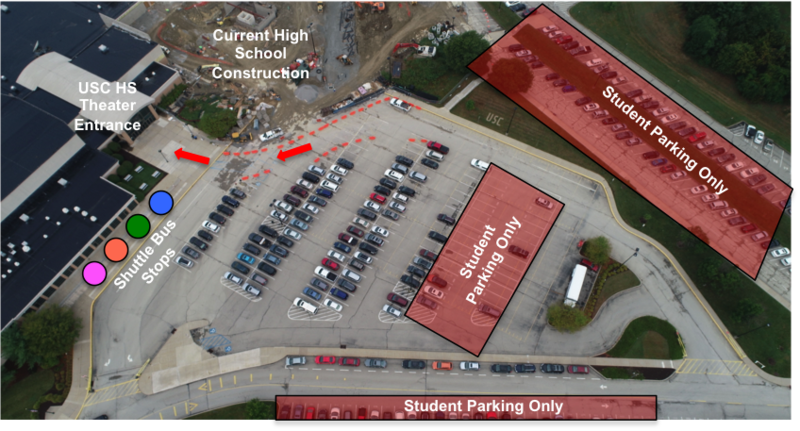 Follow directions into high school theater parking area. From Route 19S exit at Upper St. Clair/Orange Belt (Municipal Building, Library). Follow ramp and at light proceed straight across McLaughlin Run Road. This is Panther Pass. Follow signs to high school theater parking area. St. Clair Country Club parking lot – for those attending the luncheon following the lecture. Six shuttle busses, graciously provided by the Community Foundation of Upper St. Clair, service all four THS auxiliary parking lot locations. Bus signs are color coded for easier identification. In addition to bus signs being placed in the bus windows, there will also be colored bus signs placed outside of the theater entrance doors designating where each particular bus will stop for passenger pick-up when exiting the lecture. The buses start picking up from the auxiliary lots about 9:15 a.m. They do not run on a specific schedule because they leave the various lots as they fill. They make continuous loops until the lecture starts. NEW THIS YEAR: There will now be three busses, up from two, shuttling to/from the St. Clair Country Club. The third bus was added to reduce and/or alleviate member wait times. Handicapped parking is available in the high school parking lot near the theater entrance. Barnes & Noble at South Hills Village will be on-hand before and after each lecture for those subscribers interested in purchasing books to be signed by the speaker immediately following the lecture. The books will be sold at a discounted rate and may be paid for with cash, check or credit cards. In the case that there is a 2-hour delay for the Upper St. Clair School District, we will delay the start of our lecture. Exterior theater lobby doors will open at 10:15 a.m. and the lecture will begin at 10:45 a.m. In the event that a lecture needs to be cancelled for any reason, you will receive an email notification alerting you. Cancellations will also be posted on KDKA TV, www.kdka.com, NewsRadio 1020 KDKA, and this website.